I cleaned out the water & food dishes really well last night. The water dishes are full of them again. Do I need to change it everyday now? What if they get in the crabs shells? Sorry, I tried googling and searching on here but am still unsure. Hahahahahaha!! Oops....sorry!! Although that makes it even funnier that I misunderstood!! Changing the water often is never the wrong choice, but a day or two with them in there won't hurt anything. They will climb in the crab's shells but I have never seen them bothered by this. 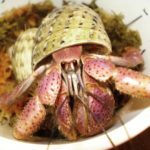 They would be cleaning the crab's body of debris and mold spores and anything else the crab may have picked up between molts - like birds on wildebeests, or those little cleaning fish on sharks. Funny story, I somehow ended up with a springtail outbreak in both my largest turtle tank and my overwinter indoor pond. No land in either tank. They were all up the sides of the glass and plastic, and jumping all over the water surface. Lasted two weeks and they all disappeared again! Interesting! I’m fascinated how these bugs spring to life in the tank and take over so quickly, seemingly out of nowhere. They typically do have a burst and then die off.